Here are some books that I'd like to recommend for your reading pleasure. Click here for my awesome selection of books and videos! Finally, we are getting the "scoop" straight from the dog's mouth!! Moose tells us just what life as a star is like - ah, fame!! I'll still waiting for my paw-tagraphed edition - I wish! Finally, the "hoomans" are starting to give us our due! This book is filled with wonderful poems that sum up all the things in dog's life - food, going for walks, getting in troubles, etc. I give this book 3 bones! In an intimate--and hilarious--diary, one dog chronicles his battle with depression, as he loses interest in the finer things in canine life, is diagnosed with the Black Dog of Depression, and rediscovers his Inner Puppy with the help of Prozac. Finally the hoomans are realizing that we dogs love a nice story at bedtime too! These fairy tales and nursery rhymes are much better than before, because they have been rewritten and are all about DOGS!! Well, let's see - I yam a Cancer, Mommy is a Gemini and Daddy is an Aquarius - does this make us a harmonious family? Well, you will just have to read the book to find out!!! This book will help you choose a dog based on your sun sign or peacefully coexist with the dog you have now. If you don't know when your dog was born, it will also help you to determine his or her sign. This is a great book that you will flip through over and over. This story is now a movie! YAY for Jacks everywhere! UPDATE 3/15/00 - My mommy saw this movie and said it was bery, bery good and made her cry a lot. Hey, it also got me lots of hugs and treats when she and Daddy came home - go figure! Sounds like a good movie to me!!! mmm! This was also made into a cartoon featuring the voice of Drew Barrymore as Olive! Olive is so cool that Nordstrom featured her in all of their holiday decorations too! WOW! What publicity for alla us Jacks!! You can even buy the toy too! Click on Olive to order her! 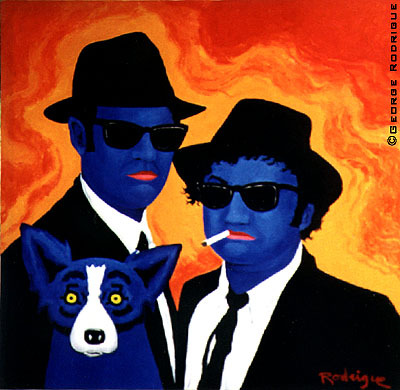 The New Orleans artist George Rodrigue features the Blue Dog in much of his artwork. He is most famous for designing a series of Jazz Festival Posters. Anybody who features a dog so prominamtly in his work has to be a great guy!! Click on the picture to the left (one of my favorites!) to explore his website! From the moment Danny sees the beautiful Irish setter, he knows Red is the dog for him. Fast and smart, strong and noble, Red is the only dog Danny wants by his side. Soon, neither boy nor dog can stand to be apart. Together Danny and Red face many dangers in the harsh Wintapi wilderness that they call home. But the greatest test of their courage and friendship will come from an enemy more cunning than any they've known before--a bear who is the undisputed king of the wilderness, a savage killer called Old Majesty. There are so many dogs out there that need good homes - a shelter is the perfect place to find your new best friend. I have never been to a shelter, but have many friends that come from there, such as Moonshadow and my friend Loki. They are both grateful to have a home to call their own. This book will help you to figure out if adoption is the right option for you, what kind of dog to look for and how to care for your new friend after they come to live with you. Best Friends is a celebration of compassion and a moving reminder of the special bond we share with our companion animal friends. Best Friends features heartwarming images of over 100 pets who have been cared for and given a second chance thanks to non-profit animal shelters nationwide. You'll meet animals rescued from fires, floods, and earthquakes, taken from unkind owners, abandoned or left homeless when an owner died, and rehabilitated after injury or illness. An introductory essay, quotes about our pet friends, background notes on all animals pictured, and a resource section round out this fine addition to the library of any animal lover. A great book for owners or people who just want to get to know more about us Jacks! This has some good information about the history of that Jack Russell in the beginning - towards the end it get a little generic. There are some helpful hints on training. The author of this book is a breeder of champion JRTs that lives in England. The book covers the breed in the USA as well as Britain, Australia and Europe. A lot of people like this book because it considers all types of Jack Russells as "correct" and does not discriminate again the "puddin'" JRTs. Now, I have a lot of Jack friends that are puddins and that does not make them any less of a Jack, let me tell you! So, I LIKE this book! MMMM! Finally a book that tells the hoomans what we have wanted all along - home cooked food! Some people refer to this as a BARF (Bones And Raw Food) diet. There are some yummy recipes here - check it out! The market for specialty pet food items is growing at a fantastic rate. Dog Treats shows readers how to prepare an array of tasty and healthful foods for their pets, and discusses how to use the treats when teaching tricks, what to do if a pet is overweight, and even how to deal with food-related disorders. Practical and entertaining, this complete, step-by-step guide to fun and funny tricks you can teach your dog also includes chapters on how to get involved in organized activities you both can enjoy, including agility competitions, tracking and herding, and formal dog shows. A quickie guide which tells what to do in case of canine athletic injuries is included. Line drawings. Beginning with four basic commands--sit, down, stand, and stay--this book shows dog owners how to train an animal to perform both simple and more complicated tricks. Instructions for each of the book's 25 tricks are presented with tips to help owners work through problems, and suggestions for putting the animal's training to effective use. 150 color photos. . This has to be one of the best books out there on raising a dog. It stresses that you are "adopting" a dog; that is, making a dog a part of your family. I can't recommend it highly enough - it should be one of the staples of any dog owners library. My hoomans love it - and treat me right! This was the first book we bought before bringing Cozmo home. It documents the birth and early life of a litter of shepard pups and describes in detail how what happens in the first year of life will affect the dog's personality. It also covers basic obedience and housetraining. A must for any puppy owner. We have referred to both of the New Skete books numerous times and it's always had the answers we were looking for. My parents bought this video and love to watch it. It covers the same principles as in the two books above in 3 tapes. I would recommend they have Jack Russells staring in the video, but hey, they like the shepherds - I guess that's OK.
Raising Your Dog With The Monks Of New Skete is a three video series which brings the monks' acclaimed philosophy, insight, and methods of training to home video. The series is a companion to the monks' best-selling books How To Be Your Dog's Best Friend and The Art Of Raising A Puppy. The videos cover all of the essential lessons of canine training and include detailed instruction on puppy development, behavior conditioning, and obedience training. The series contains the one hour special as seen on public television. Here's a good book for kids that want a dog. It introduces them to all the work it involves to be a good dog owner! Ages 3-6. Brown is back with another sure-to-be-popular story about "personable" Arthur, the likable aardvark. This time, however, it's Arthur's new puppy, Pal, who's the star of the show. Cute, cuddly Pal is driving Arthur and his family to distraction--he's chewing up the furniture, dribbling in the house, digging up the yard, howling when he's lonely, and refusing to be walked on a leash. It appears he's destined for the garage--until Arthur intercedes and teaches him some proper manners. As usual, Brown's sweet, colorful illustrations sparkle with humor and child appeal, and his message (to prospective puppy owners) comes through loud and clear. This is a nice, colorful book for children who are interested in owning a puppy. Great pictures, colorful and an easy to read format. Recommended for children 9-12 hooman years. This is a cute book about a boy and his dogs, who happen to turn into hoomans one day. Boy, they get in a lot of trouble!!!! Carey has three ordinary, lovable dogs. Until one day, during a solar eclipse, he finds three pretty strange people who used to be his pets. Butch, now a teenage boy, starts chasing cars and yelling at the squirrels, while DeeDee finds (to her great delight) that she can open a refrigerator and get all the food she wants. Ol Ed seems to just want to take a nap, but how is Carey going to control the other two? And what will happen when his mother gets home? This book provides the motivation to get you and your dog off the couch and out the door to share that perfect activity. One that will fit your budget and your capabilities while providing fun times together for the two of you. Enjoy! Now, this is the book you HAVE to convince the hoomans to buy for you. This is how you will convince them that you are the SMARTEST dog in the world! Hey, if you don't believe me, look at the dog they put on the cover - a Jack Russell!!! 'Nuff said!